As the highest mountain in Africa and one of the largest freestanding volcanoes in the world, Kilimanjaro remains a revered and classic image of East Africa. Its snow-capped peak rising 19,341 ft (5,895 m) above the tropical African savanna is an irresistible draw for trekkers, particularly since no technical climbing is required to reach the summit. Kilimanjaro is one of the “seven summits” representing the highest peaks on each continent. However, because it does not involve technical climbing, the difficulties are often misjudged. Climbing Kilimanjaro is a serious undertaking, requiring serious preparation. Despite being higher than classic trekking destinations in Nepal, such as Kala Pattar (18,450 ft; 5,625 m) or Everest base camp (17,598 ft; 5,364 m), typical ascent rates on Kilimanjaro are considerably faster (4–6 days vs 8–12 days). The classic route up Kilimanjaro is the Marangu route (64 km), usually sold as a “5 day, 4 night” trip. Marangu is frequently nicknamed the “Coca-Cola” route, since accommodation and food are provided in bunkhouses and the trail is wide and relatively easy compared with other routes. There are at least 9 alternative routes (Map 4-02), including the stunningly beautiful Machame route (the so-called “whiskey” route, since the days are generally longer, with tougher climbs). This author can vouch for the dramatic rugged beauty of this hike. Machame and other routes involve camping but are usually sold as 6- to 9-day packages, providing more opportunity to acclimatize and greater chances to successfully summit. Kilimanjaro can be climbed throughout the year (March–April are often the wettest months), but the weather is unpredictable, and the climber must be prepared for extreme weather and rain at any time of the year. Climbing Kilimanjaro is a dream for many who visit Africa. However, a large number of travelers are ill-prepared, ascend too quickly, and consequently fail to summit. With due preparation and more reasonable ascent rates, climbing “Kili” is an aspiration that can be successfully and safely accomplished by many. Routine, hepatitis A & B, typhoid, and rabies. The main medical issues for those attempting Kilimanjaro include the prevention and treatment of altitude illness and the potential for drug interactions between medications used for altitude illness and antimalarial or antidiarrheal agents commonly used by travelers to Tanzania. Altitude illness is a problem on Kilimanjaro and a major contributor to the reason that only 50% of those attempting the standard 4- to 5-day Marangu route reach the crater rim, known as Gilman’s Point (18,652 ft; 5,685 m), and as few as 10% reach the summit, known as Uhuru (Freedom) Peak (19,341 ft; 5,895 m). 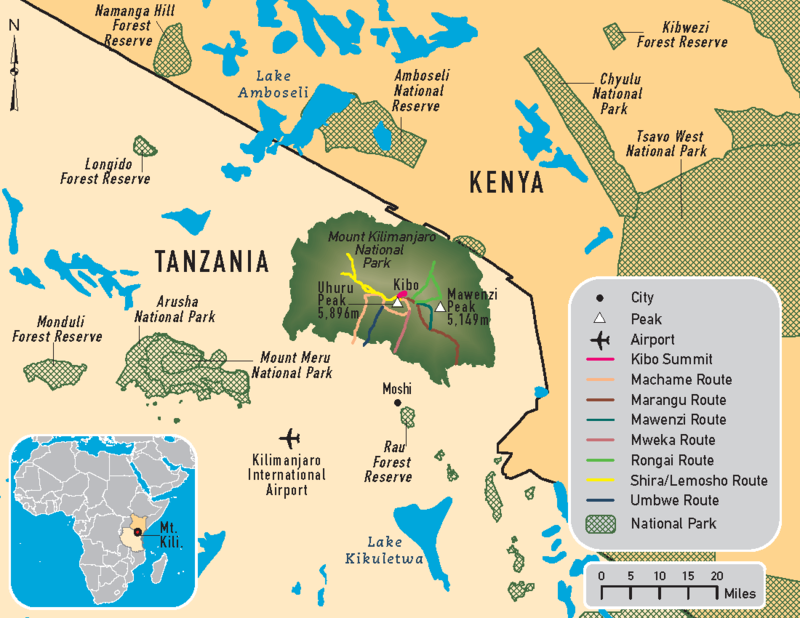 Prevalence rates of AMS were 75%–77% in recent studies of 4- and 5-day ascents on the Marangu route. Those using acetazolamide were significantly less likely to develop AMS on the 5-day ascents. Every hiker on Kilimanjaro should receive pre-travel advice on AMS, be able to recognize symptoms, and know how to prevent and treat it. People with certain underlying medical conditions, including pregnancy, cardiac and lung disease, and ocular and neurologic conditions, may be more susceptible to altitude-associated problems or may be taking medications that may interact with altitude medications, and should consult a travel health provider with knowledge of altitude illness before travel. For those with a past history of susceptibility to AMS and for those in whom adequate acclimatization is not possible (most “Kili” clients), the use of medications such as acetazolamide to prevent altitude illness is recommended. Acetazolamide accelerates acclimatization, is effective in preventing (beginning the day before ascent) and treating AMS, and is safe in children. For those who are intolerant or allergic to acetazolamide, dexamethasone is an alternative for prevention of AMS, but there are cautions involved in using dexamethasone for ascent. Consideration should be given to carrying a treatment course of dexamethasone for high-altitude cerebral edema (HACE). Travelers with symptoms of altitude illness must not continue to ascend and need to descend if symptoms are worsening at the same altitude. A flexible itinerary and having an extra guide who can accompany any member of the group down the mountain if he or she becomes ill are considerations. Kilimanjaro is unique in that its tropical malaria-endemic location means that many trekkers will be on antimalarial drugs and may need to continue them after their climb, particularly if they are also visiting game parks and staying overnight at altitudes <1,800 m (5,906 ft). Malaria chemoprophylaxis is recommended for Tanzania (even if only for a short trip). If a traveler flew directly into Kilimanjaro International Airport (2,932 ft; 894 m) and went the same day to an altitude above 1,800 m, there would be no risk of malaria. However, most people will be on safari or traveling before or after their Kilimanjaro trip, and therefore will be on prophylaxis. Kilimanjaro is also a unique destination in that high altitude will affect everyone, and possible interactions should be considered between drugs commonly used for chemoprophylaxis or treatment of AMS, high-altitude pulmonary edema, or high-altitude cerebral edema, such as acetazolamide, dexamethasone, and nifedipine. Fortunately, there are no reported clinically significant drug interactions between common malaria chemoprophylaxis agents (atovaquone-proguanil, doxycycline, or mefloquine) and acetazolamide or dexamethasone used to prevent or treat AMS. Nifedipine is metabolized by the CYP3A4 enzyme and concurrent use of CYP3A4 inhibitors, such as doxycycline, could lead to elevated plasma levels of nifedipine and potentially lower blood pressure. Therefore, it would not be advised to take nifedipine for altitude illness prophylaxis concurrently with doxycycline. There are no reported drug interactions between acetazolamide and the fluoroquinolones (ciprofloxacin, levofloxacin) or macrolides (azithromycin) commonly used to treat travelers’ diarrhea. There is a potential increased risk of tendon rupture when dexamethasone is used with fluoroquinolones. Avoid concurrent use of macrolides and nifedipine. Treks on Kilimanjaro are physically demanding and require a good level of fitness and preparation for the elements. Kilimanjaro weather is characterized by extremes: be prepared for tropical heat, heavy rains, and bitter cold. Keep gear, especially one’s sleeping bag, in waterproof bags. Travelers should have adequate health insurance, including medical evacuation insurance. Travelers are advised to make sure their medical care and medical evacuation policy will cover any potential costs for a rescue or evacuation from the top of the mountain. Carry a first aid kit that includes bandages, tape, blister kit, antibacterial and antifungal cream, antibiotics for travelers’ diarrhea, antimalarials, antiemetics, antihistamines, analgesics, cold and flu medications, throat lozenges, and altitude medications.